As a focal point and seating area in a botanical garden, the featured pergola consists of curved seating walls with built in planters. The pergola’s cross beams provide visitors with dappled shade while the central garden draws seasonal interest through a variety of perennial plants as well as additional seating via lawn space. 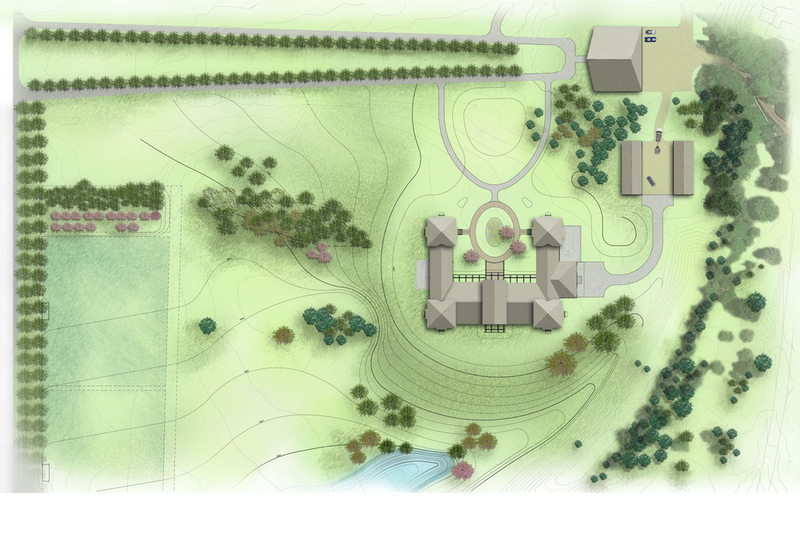 This aerial view rendering of a country estate uses clusters and arrangements of evergreens and flowering trees to distinguish spaces: from framing a view from lawn down to a lake, to the linear allée of trees drawing vehicular traffic up the driveway, vegetation takes on a significant role in making this large space accessible and interesting while exploring on foot and by car. 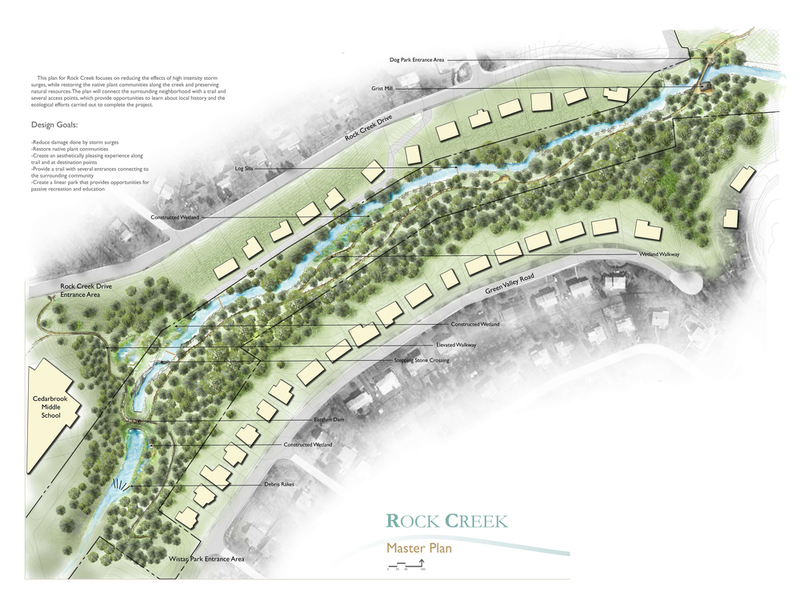 The above masterplan for Rock Creek Park was completed in order to address several challenges to the existing park. Namely, access to park was limited, thus the redeveloped masterplan uses landmarks to draw visitors towards the creek banks and the multiple walking and hiking trails that border it. An earthen damn is used to control flooding and stop erosion as well as to restore vegetation that previously was susceptible to being washed out due to large storms. 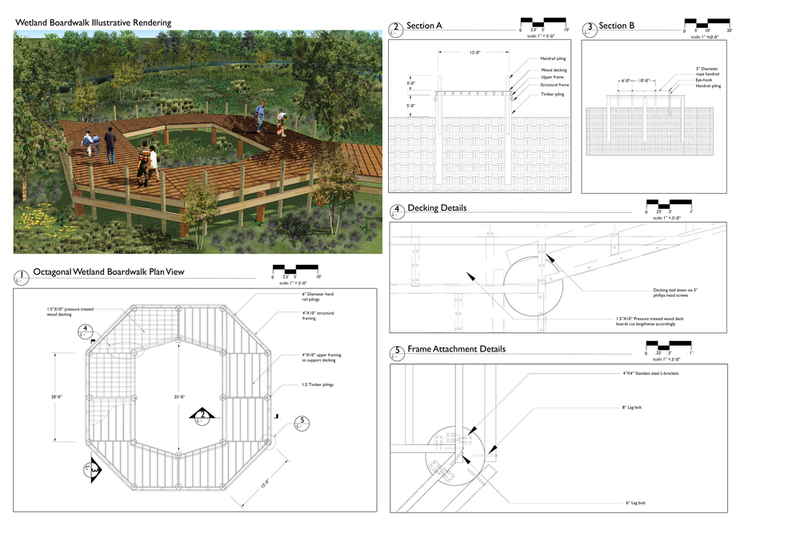 Both ecological restoration and human-centric design are featured in the wetland boardwalk design. PA native wetland species are framed by an octagonal walkway that allows park visitors to enter and enjoy the wetland without disturbing the vegetation. The boardwalk brings pedestrians into the park as well as an understanding of these unique environments, normally difficult to access by foot. A project to enhance the under utilized and somewhat overgrown Fort Washington State Park included the design of a park visitor interpretive center. The above design incorporates a green roof into the existing topography of the park. Visitors can experience the combination of native vegetation and wildlife on the structures roof, as well as meeting, and dining space in the area below. The plan view of a conceptual city park design shown here would replace an existing parking lot in the Callowhill neighborhood of Philadelphia. The project calls for a naturalistic pond, curvilinear paths and tying into the Philadelphia highline to increase circulation and green space in a neighborhood lacking in both.